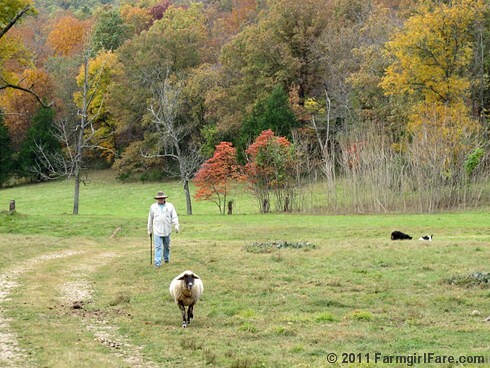 Last spring my hunky farmguy Joe and I decided we would start spending part of each Sunday working the sheep. We've been really good about sticking to our schedule, and in all these months we've only blown off a couple of weeks. Since sharing a farm with dozens of critters (current count: 78) means we live in a constant state of surprise, uncertainty, and the total inability to do almost anything at a designated time, keeping to this new routine has been nothing short of miraculous, especially since working the sheep is not something we really look forward to doing. 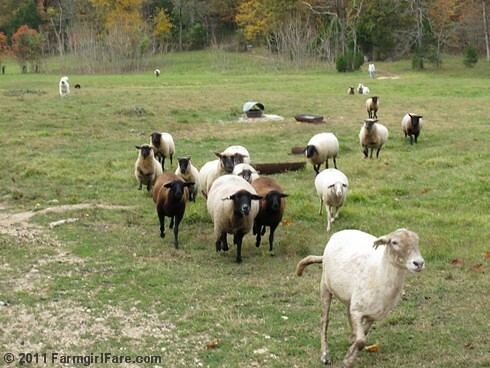 This time of year, working the sheep mostly entails catching each one up with a shepherd's crook and using a backpack drench gun to give them a dose in their mouths of the 50/50 mix of organic raw apple cider vinegar and garlic juice we use as a natural wormer and overall health tonic. We also trim hooves and administer any minor first aid as needed. There might be some snuggling involved. When everyone is in good shape and everything goes smoothly (hey, it's been known to happen), working the sheep doesn't usually take all that much time. Because we're currently in the middle of breeding season, our flock is split up into three groups—five, if you count the two old pet wethers keeping our new young ram company in their own pen, and the ewe with the bad hoof in sick bay—so we can't just lock them all up in the barn or barnyard on Saturday night so they're up and ready to be worked the next day. Thankfully our sheep are addicted not only to treats but to the sound of treats, so loudly shaking a bucket will usually have them stampeding right past you and straight toward the feed troughs in the barn. But when the wild persimmons are falling from the trees, the lure of the bucket isn't enough, and you have to traipse way out into the field and get them. On those days, it takes longer to move the sheep than it does to actually work them. Trying to relocate a bunch of stubborn, uncooperative animals can sometimes really try your patience. Fortunately looking at all this beautiful scenery does just the opposite. 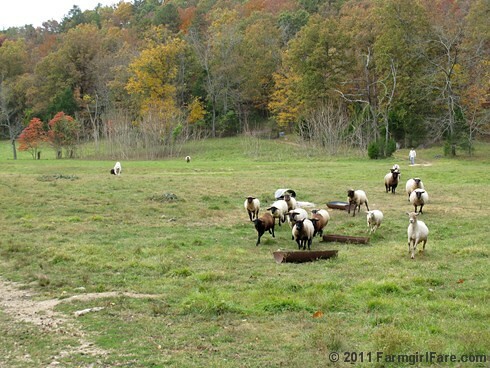 Want to learn more about our everyday life on the farm? Just click here. How about more autumn color? Here. 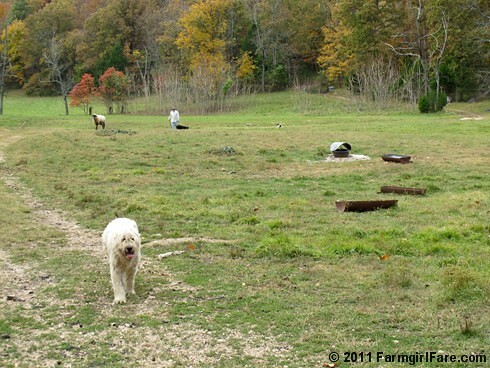 © FarmgirlFare.com, where this particular sheep herding job might have been a little easier if a certain stock dog member of the Mole Patrol (who can be seen digging in the background of the above photo) hadn't been so into his other job. I'm blaming that relentless taskmaster of the team, Captain Bert. Good thing they've been catching a lot of moles. 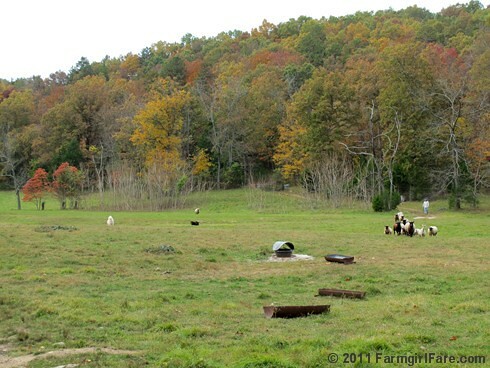 Your autumn is looking very beautiful on your farm. Captain Bert cracks me up - it seems he just does his own thing and can get away with anything. He's quite the ring leader. I thought I saw "someone" back there on mole patrol! LOL!! I love the info on your natural wormer remedy. Do you do this for your chickens? I'd love to use something natural for mine. Without the sour, the sweet ain't as sweet, right? Granted for us, our two goats keep us annoyed enough that their two sheep buddies look like angels. Thanks for the natural de-wormer recipe, everyone has been recommending medicated this and that. And I'd really rather stick with natural! Beautiful and smile inducing photos, as always! Hee, I have a blog to now, and I wonder wich blog directories on the net you know, and your blog is subited? You are always busy, but you and your hubby seem to enjoy it. You make a good team. You have such lovely scenery to look at each day. Just beautiful pics. Thanks for sharing. The garlic and vinegar is great stuff. We don't specifically worm our chickens - and I don't know anything about chicken parasites - but it would certainly be good for your chickens as an overall health tonic. You'd just have to get them to eat it! Whenever we have a sheep who is under the weather for any reason, they always get several doses of garlic/vinegar. In many instances, garlic has been proven to work as well or better than penicillin as an antibiotic. And the best thing is, you can't hurt anybody by giving it to them - unlike, for example, how penicillin also kills all the 'good' bugs in your system along with the bad ones. As I was saying above, the garlic juice and vinegar are both really great. That garlic juice link in the post gives helpful info on dosing, etc. and will also take you to several studies done on real sheep farms, showing how well the garlic juice worked against internal parasites. This natural remedy is getting a lot of attention because so many sheep farmers are using Cydectin and Dectomax, which are at the 'top' of the wormer ladder, and once their sheep develop a resistance to it, there are no other commercial wormers left for them to use. I do have to mention, though, that because the parasites are so bad here (they LOVE our hot and humid weather), we still also have to give our sheep commercial wormer. For us, I've found that Prohibit drench works best (used to be called levasol or levamisole), and thankfully you can now buy it again, because for the past several years it totally disappeared from the market. Of course it's come back a different color, so I'm not sure it's the same formula. Vets and other sheep people will tell you I'm wrong, or it's not possible, but I have saved several sheep with bottlejaw by giving them Prohibit drench - although the injectable levasole worked better. I order the Prohibit packets from valleyvet.com. It's also one of the most economical wormers you can buy. 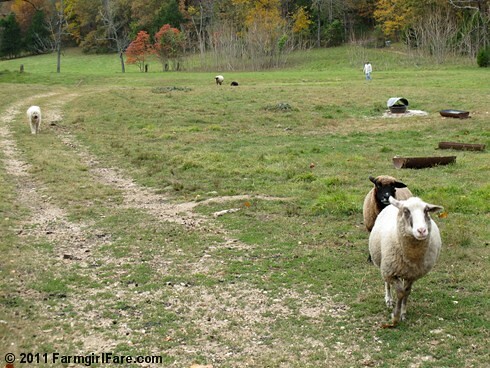 In addition, because we have white tailed deer here, we also have to give the sheep Ivomec. It doesn't seem to work well for us against the barber pole stomach worms (which are our biggest problem and the ones that cause bottlejaw), but it's the only thing that works against (often deadly) infection by the meningeal worms that are carried by the deer and snails. Llamas are also susceptible to infestation, too. I've also found that with the garlic juice, it works best if the sheep aren't already severely infected with worms. If they are, then even the five day dosage wasn't enough - at least in our experience. Again, the great thing is that both the garlic and vinegar do so many other beneficial things - and you really can't overdose them - so I definitely recommend them. Congratulations on your new blog! Your farm animal photos are wonderful. I'm afraid I don't know many blog directories, but you might check http://blogtopsites.com. Or you can try Googling 'blog directories' or even 'farm blog directory' if you're specifically trying to find listings of other farm blogs. 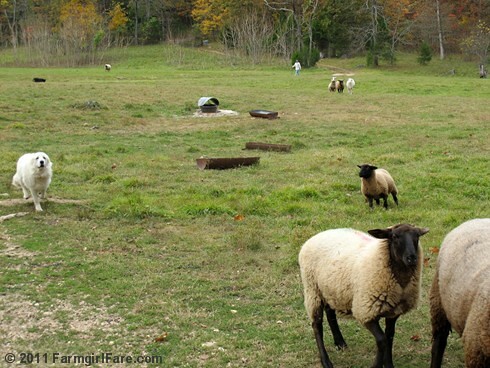 We also give our sheep (and all the other critters) food grade diatomaceous earth mixed into their feed and minerals, which is another natural wormer and all around health supplement. You can read more about how/where we use this marvelous, totally organic stuff in this post. 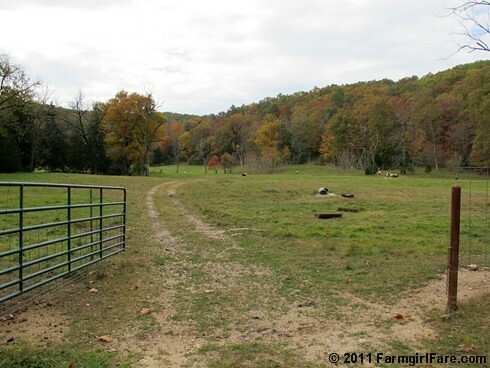 @ farmgirl Susan: Thanks for your help! I searched like you said, and I have found some. But the're are so many blog directories! So are our horses. But, it's really scary to have a 1000+ lb animal running at you for a treat. Many, many thanks for all of the great info...just another reason why I LOVE your blog!